Tudeley Woods is an RSPB reserve near Tonbridge. It is an area of wooded hillside with mixed trees including areas of Sweet Chesnut copice. 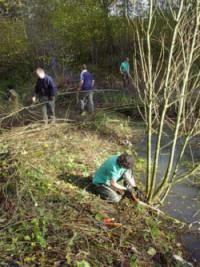 This task was to clear the willow and silver birch from around a man made pond. This would let the light in to an other wise overgrown area of swamp and rush. This is an example of conservation at its most confusing. Apparent destruction by tree felling and burning to preserve habitat. Creating an open area in woodland allows in light which encourages the re-growth of under brush and provides a place for butterflies to feed and display. It is this diversity of plants and insects which attracts the birds to the reserve. 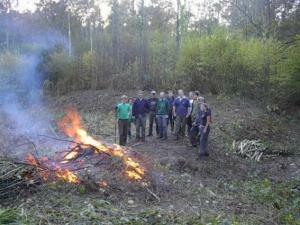 A large team of volunteers turned out, to cut birch regrowth on a site we had originally cleared in March 2004. The ride is in the middle of dense chestnut coppice and provides an open sunny area for butterflies. If the area was left to grow it would become dense birch wood. In one growing season the saplings were 1.5 -2m (5-6 ft) tall! Rotten tree stumps which were left behind when the ride was originally created provide ideal habitat for mosses and lichens. 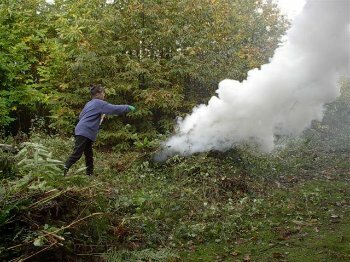 Using machinery to clear the scrub would damage the habitat which had been created. This is where the volunteer armed with slasher and bowsaw has the advantage of treading more lightly on the ground! 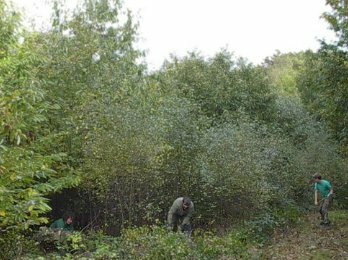 Some larger trees also needed coppicing to maintain a suitable width of open habitat to encourage butterflies to enter and explore the woods. Tudeley Woods is an RSPB reserve. 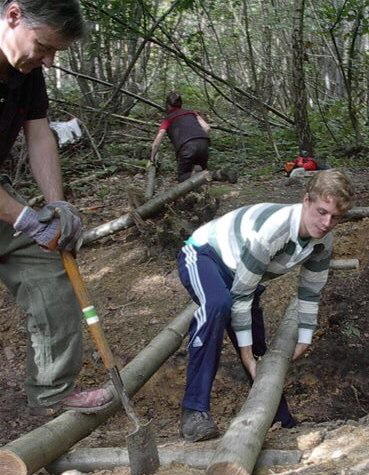 Other recent task in Tudeley Woods included building a bridge and repairing a bench. The finished bridge. 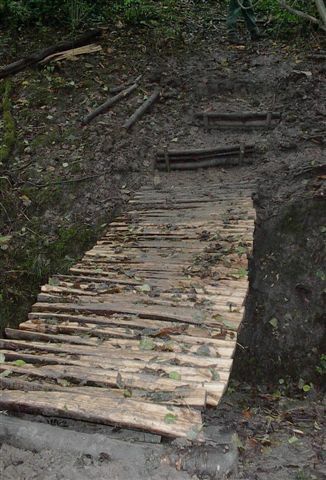 This is not on the public path and is to aid the warden and other work parties to access the remote parts of the wood. Another STCV bridge at the RSPB Reserve at Tudeley spanning a shallow ditch on a public path, to improve access to this beautiful woodland for footpath walkers of all abilities. It was gratifying to hear the positive comments from some of the regular users we encountered throughout the course of the day. 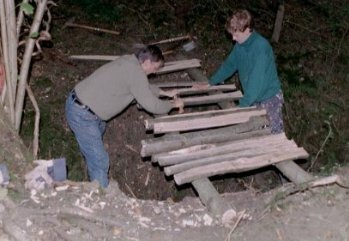 Using sweet chestnut felled from the immediate area the bridge should last for several years.